Summer's here and as we all know there's really no better place to hit the beach than the UK when the weather's behaving itself. We've picked out some of our favourite sandy strands for you and the family to frolic on. Not only is Appletree Bay one of the most beautiful beaches on Scilly (and it has got some stunning contenders), you will often get it all to yourself. It’s the perfect place to picnic on golden pillows of sand, and dip your toes in azure waters that stretch between Bryher and Samson. If there's a better urban beach in the country we'd like to know about it, Bournemouth's long stretch of gently shelving sand is as glorious a beach-bumming location as you'll find. It's varied too: some sections can be reached by wooded valleys known as chines. But wherever you are it's clean and safe for children, and clearly marked sections for dog walking, and a decent place to eat or drink is never more than five minutes' away. On this part of the south coast, a sandy beach like this is a rarity. Clamber up the big Camber dunes and you can take in the immensity of it all before stripping to your Speedos and tripping through the shallow waves before diving in. Or, as many do, you can just walk the dog, afterwards repairing to the fab Gallivant for a slap-up lunch. The sweeping sands and dunes of Daymer Bay in Rock are beloved of kids, sun-worshippers and windsurfers alike, and just behind the beach is the perfectly rounded grassy knoll of Brae Hill – a great place for a picnic. The beach is dog-friendly too, and there’s a car park and refreshments available. Not one beach, but three – Fisherman’s Cove, Smalls Cove and – the largest – Mill Bay, situated on the quieter side of Salcombe's estuary but easily reachable by boat or ferry (it takes much longer by car which is why a lot of people don't bother). Lovely and sandy, with facilities that include an organic outdoor café above Fisherman's Cove. The Falmouth area's best beach, a beautiful, sandy crescent, so perfect for kids, with a curved breakwater that provides shelter. There are plenty of facilities, including the excellent Sam’s on the Beach, the Rashleigh Inn and a good shop stocking everything you need for a day at the beach, as well as watersports equipment for hire for a more active day on the water. 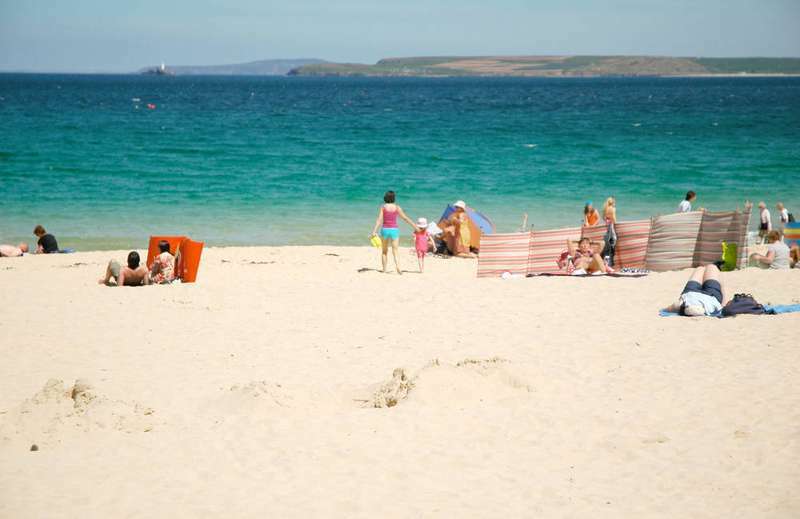 With white sands lapped by turquoise seas, St Ives’ Porthminster Beach is far and away one of Britain’s best beaches, a sheltered, palm-shrouded strand that is a favourite of bathers and local sand sculptors – and you couldn't be much closer to the life and facilities of St Ives. These three miles of pristine sandy beach are not only favoured by dog-walkers and surfers but also featured in the video for Robbie Williams’s single ‘Angels’. If that's not enough, you can also explore Braunton Burrows immediately behind, a massive area of almost Alpine sand dunes that is protected as a UNESCO Biosphere Reserve. One of England’s best beaches stretches for four miles from the Sandbanks ferry terminal at Shell Bay to the base of the Old Harry Rocks. These soft sands, backed by dunes and heathland, make up an important National Trust-owned nature reserve, and also mark the start of the South West Coast Path. It can get packed in high summer, but it doesn’t take much effort to find more secluded areas (including one section that is naturist). A great sandy beach that's open to dogs year-round and backed by a fabulously huge playground of sand dunes. You’re pretty likely to see seals basking in the waves offshore, and there’s a car park and a great beach café – plus the village has a good chippy and an excellent pub, the Fishermans Return. If you're feeling energetic you can do a lovely circular walk north through the dunes and then back across fields and to the village.